Dignity factory workers producing shirts for overseas clients, in Accra, Ghana. Underlining the need for the sustainable industrialization of Africa, the United Nations General Assembly today unanimously adopted a resolution proclaiming the period 2016-2025 as the Third Industrial Development Decade for Africa. By the terms of the resolution, which was adopted without a vote, the General Assembly called on the African Union (AU) Commission, the New Partnership for Africa's Development, the Economic Commission for Africa and, specifically, the UN Industrial Development Organization (UNIDO), to develop, operationalize and lead the implementation of the programme for the Third Decade, in accordance with its mandate and through voluntary contributions. Noting that Africa remains “the poorest and the most vulnerable region in the world,” the Assembly highlighted the need for the continent to take “urgent action to advance sustainable industrialization as a key element of furthering economic diversification and value addition, creating jobs and thus reducing poverty and contributing to the implementation of the 2030 Agenda for Sustainable Development,” according to the resolution. The Assembly also encouraged UNIDO's Director General to mobilize adequate resources for the implementation of the Decade, and reiterated that African countries have primary responsibility for their own economic and social development. In addition, under the resolution, the General Assembly invited UNIDO, in close collaboration with the AU, to scale up its technical assistance to African countries in accordance with its mandate to promote inclusive and sustainable industrial development for the successful implementation of the Third Decade. It also invited UNIDO to foster partnerships, as appropriate, with other relevant entities in the UN development system. The Assembly also called for enhanced international cooperation, including North-South,South-South and triangular cooperation, in support of Africa's industrialization, including through the implementation of the Third Decade, and reaffirms that South-South cooperation is not a substitute for, but is rather a complement to, North-South cooperation. The Second Industrial Development Decade for Africa was from 1991 to 2000. 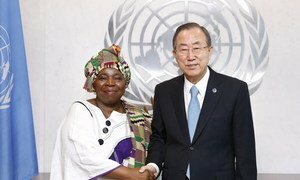 United Nations Secretary-General Ban Ki-moon has welcomed a decision by the Assembly of Heads of State and Government of the African Union (AU) that sets out steps towards self-reliance, particularly in relation to the regional body’s peace and security budget.